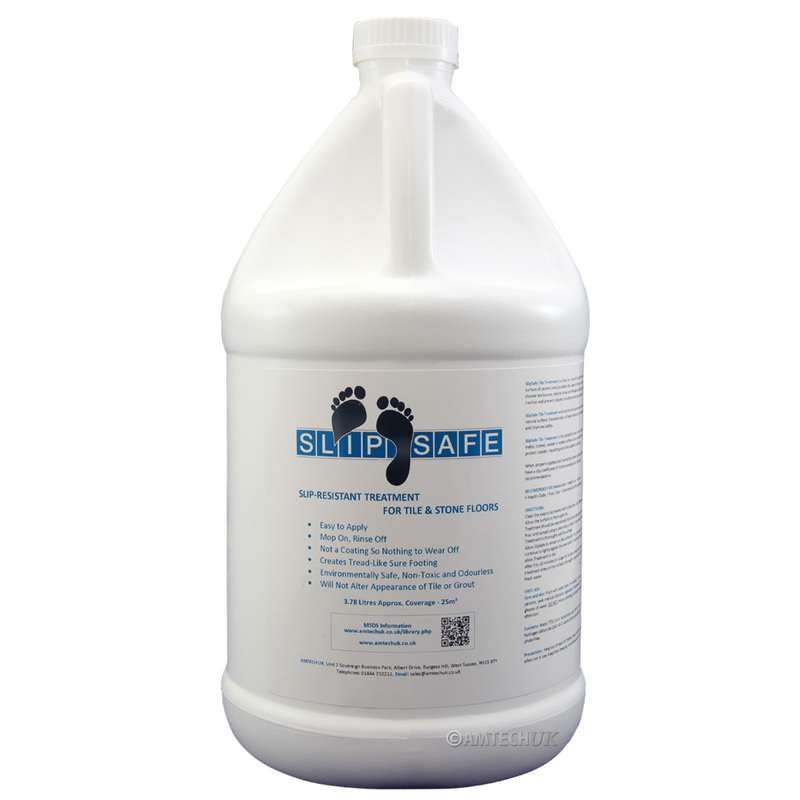 SlipSafe Tile Treatment is a mop on, rinse off solution that treats the surface of ceramic and porcelain tile, quarry, terrazzo, concrete, shower enclosures, natural stone and fibreglass surfaces to enhance traction and prevent slippery conditions particularly when wet. SlipSafe Tile Treatment works at the micro-pore level to enhance the natural surface characteristics of these materials to increase traction and improve safety. The treatment works to increase the slip coefficient (slip resistance) of the surface to which it is applied. The minimum required standard is .5 or better. SlipSafe Tile Treatment positively increases the slip coefficient to levels of .6 or better. SlipSafe Tile Treatment is not suitable for use on vinyl, linoleum, wood, metal, coated, waxed or sealed surfaces. Care should be taken to protect carpets, moulding and other adjacent materials. Coverage approximately 6.5m² per litre. Allow 10 minutes of dwell time and then rinse off. 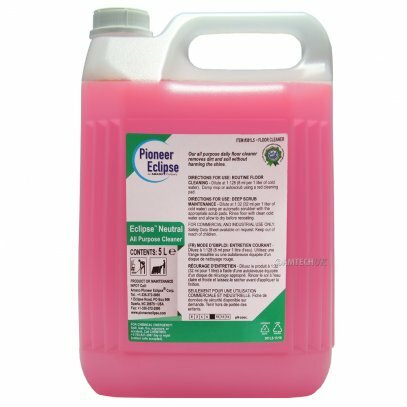 Clean the area to be treated with Eclipse heavy duty degreaser. Treatment should be used directly from the bottle without dilution. Pour and spread using a clean mop or brush. Apply enough SlipSafe Tile Treatment to thoroughly wet the entire surface. Allow SlipSafe to dwell for 5 to 10 minutes (or longer for harder surfaces). You may continue to lightly agitate the area while it treats the surface. Do not allow Treatment to dry! After 5 to 10 minutes and before the treatment dries on the surface, thoroughly rinse the floor with clean fresh water. Natural materials such as ceramic, granite, terrazzo, slate, porcelain tile, concrete and bathtubs have natural voids in them. The larger the void, the more the surface of that material is slip resistant. This void creates a tread for you to walk on. Ceramic or glazed tiles, as well as porcelain, are coated to create a shiny finished look to a floor. These coatings fill in the natural void up to 70%. When the surface is wet, the water fills in the remaining 30% of the void and that is why a floor becomes slippery, not allowing any space between the water and the bottom of your foot thereby creating a hydroplane effect. SlipSafe is a mop-on/rinse-off solution that microscopically treads the surface of ceramic tile, quarry tile, terrazzo, concrete and other natural stone surfaces to mitigate slippery conditions on wet floors. It increases the coefficient of the surface when wet. How is SlipSafe treatment applied? You will simply need a clean cotton mop and a bucket. Pour the treatment into the bucket and liberally mop on a small test area. With firm foot pressure, test the surface resistance. The resistance should be dramatic within 3-5 minutes (4-8 minutes for porcelain or fibre glass). Thoroughly rinse solution off the tile with clean water. Treat the remaining area in sections that can be mopped and rinsed clean of the solution in the same time frame as the test area. For a bathtub, you will need a nylon bristle brush. Close the drain and pour in approximately 180ml of treatment. With the brush, pull the treatment to the upper end of the bathtub as the slope will cause the treatment to pool at the lower end. Keep the bottom of the bathtub covered with treatment for 4-8 minutes. Thoroughly rinse the solution out of the tub with clean water. Is SlipSafe treatment solution dangerous? No. The treatment solution is odourless, non-toxic and environmentally safe. It is actually much less offensive than ordinary household bleach. As with all chemicals, SlipSafe should be handled with care and kept out of the reach of children. How often should SlipSafe treatment be applied? We recommend treatment be applied once a year for commercial locations and once every two to three years for residential locations. Housekeeping maintenance is important. A dirty, wet surface will not afford maximum slip resistance and accident protection. Will SlipSafe treatment damage tile or grout? No. Extensive research and testing of the product was conducted to eliminate any harmful effects to tile and grout prior to its launch. How much will a bottle of SlipSafe treatment cover?